BRR!! I never thought I would see the day that I would want to get away from the cold. This snow in Boulder has dropped the temperature in my house to below 60 and I am freezing! If you are feeling the cold of the winter coming, this is the perfect recipe for you. I saw a recipe for zucchini cheese soup a while back on Cinnamon Girl Recipes and was so excited to find another clever way to use up my zucchini. The zucchini I used for this recipe weighed in at 9 pounds! As you can see, it was taller than a wine bottle and bigger than my thigh around! If you are like me and love broccoli cheese soup, then you will love this! I decided to go with pepper jack cheese for this recipe to switch things up a bit; I loved the added kick. This soup is easy to make and will warm you up on any cold day. Heat olive oil in a large saucepan over medium heat. Add the carrot, onion and celery and sauté until soft (about 5-10 minutes). Add the garlic and thyme, then season with salt and pepper. Add the zucchini, sautee for a few more minutes. Add the broth and let the soup simmer for about 15 minutes. Puree the soup with an immersion blender (or in a regular blender) until smooth. You complaining about the cold? You used to ride in just a t-shirt with your coat open even though it was 20 degrees on the mountain. I guess you’re really going to love this winter break in Hawaii! I just posted one of Reeni’s soups. I don’t know how I missed this one – I always have a few zucchini “clubs” to use up. Love pairing the mellow zucchini with the pepperjack. Am bookmarking this one! The photo entices – bring some “green” back into my kitchen. Below 60 degrees? That’s swimming weather in Minnesota! Yum! Love the pepper-jack here…must give it a nice spice. And that zucchini is insane! i love that you used pepper jack! This soup looks just delicious! 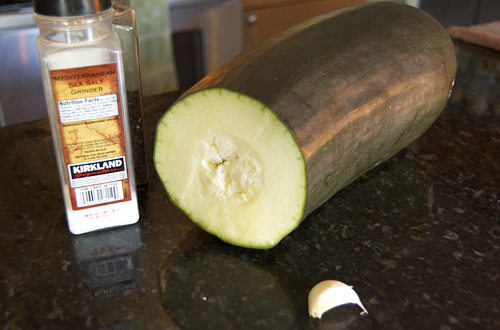 Oh I am so curious to how zucchini soup tastes… That was one huge zucchini you had there! The soup looks delicious – and I’m not a fan of the cold, so I feel your pain! I can’t really complani about the cold because I live in Georgia, but it feels like it should be sop season mentally! It’s a great way to use up leftover veggies. 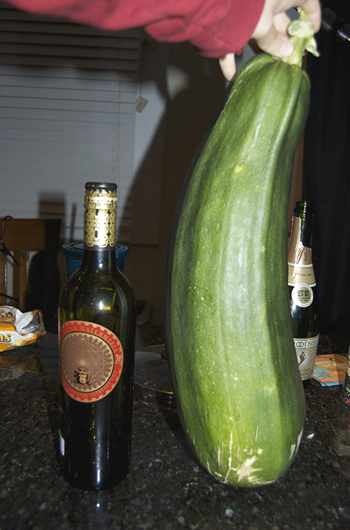 That was one heck of a zucchini! 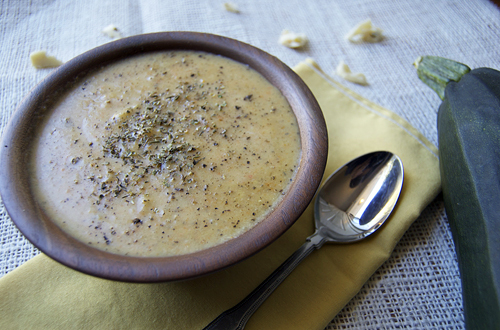 I love the sound of this soup – and I would not be able to handle the snow and cold in Boulder! We’ve already gotten a sprinkle here and I was ready to cry. All the right ingredients. I would say pepper jack was a good choice. Sounds delicious! Great idea on this combination. 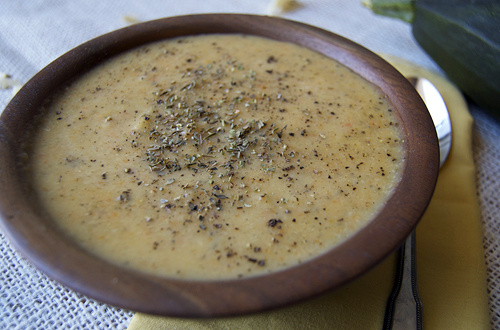 I love broccoli cheese soup and I think this would be a great alternative! That zucchini is impressive! What a great way to use that huge zucchini! Love all of the garlic and the use of jack cheese. What a great dish for cold weather. This recipe is fantastic I just made it and I have to say wow Perfect.